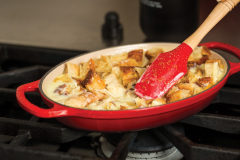 Le Creuset Cast Iron Braisers are enamel coated cast iron. This helps cook food evenly without staining the inside of the braiser. 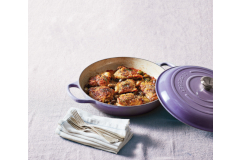 Le Creuset braisers have a snug fitting lid to help lock in moisture to keep food from drying out and locking in flavor. The enameled braisers come in all of Le Creusets signature colors. 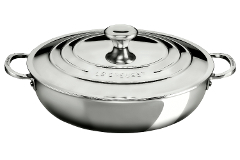 The braiser handlers are large to accommodate oven mitts for a sturdier grip.The new Buffet Casserole features a shallow cast iron base with a glass lid to monitor your cooking process. 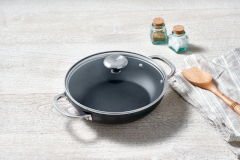 The Toughened Nonstick Braisers have the same wide, shallow profile, but with Le Creuset's toughened nonstick interior finish.